We offer weekly, bi-weekly and semi-monthly calculations. Basically, we meet the demands of your team. Our office will also assist preparing State and Federal deposits (depending on the type of organization) and. In addition, we can handle Workers Comp audits, and prepare required quarterly reports and Oklahoma Employment Security Commission (OESC). Our team can handle employee/employer contribution plans such as Cafeteria Plans, Simple K and Sep IRA's. 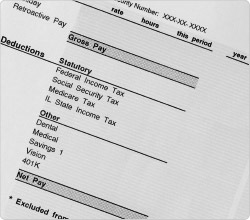 There are many facets regarding payroll specifics. Call us today to set up a free professional consultation. Our office will make payroll simple for you. We offer weekly, bi-weekly, and semi-monthly payroll service. Basically, we meet the many demands of your team. Offering more services to you than just getting the checks to your employees, we ensure you are able to maintain tax compliance. Managing your monthly payroll tax deposits is just the beginning. Each month, quarter and end of the calendar year, each payroll tax report is completed, paid, and then filed. We do this for your convenience and believe that as a business owner, you should have more time to do what you want. There are many faucets regarding payroll specifics. Contact us today to set up a free professional consultation.